Everything started with Pi Day that has been celebrated on March 14 since the late 1980s. Such a date was chosen because 3.14 corresponds to 3/14 in the month/day format. The first celebration was organized by American physicist and curator Larry Shaw who worked at the San Francisco Exploratorium. In 2009, the designation of Pi Day was officially supported by the U.S. House of Representatives. As the fundamental circle constant, π amounts to the number of radians in half a turn. In 2001, Robert Palais proposed using the number of radians in a turn, i.e. 2 π, instead. 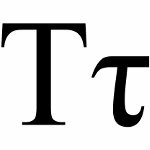 He suggested that a “pi with three legs” be used to represent the new constant. Nine years later, Michael Hartl proposed to denote Palais’s circle constant with the letter tau (τ). Neither Palais’s nor Hartl’s proposal has been taken up by mathematicians. Nevertheless, a small part of the mathematical community celebrates Tau Day, also known as Two Pi Day, on June 28 (tau equals approximately 6.28, which corresponds to 6/28 in the month/day format). Pi Day is commonly associated with consuming pie because the words “pi” and “pie” sound the same in English and because pies are circular. People who celebrate Tau Day jokingly suggest that one should eat twice the pie on this day.